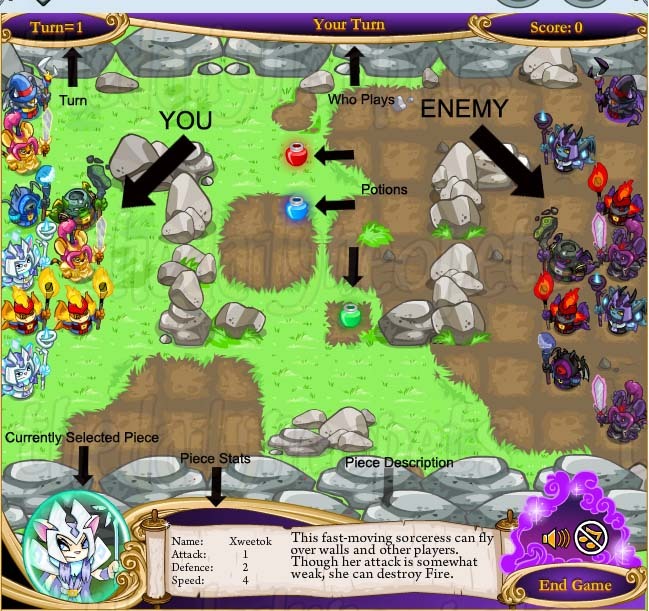 Sorcerer's Skirmish is the Neopets take on a classic military-esque board game. It's up to you to devise a strategy and direct your troops in battle, while making sure you keep your leader safe. Burnish those swords, shine up those marching boots and charge! All you need to play this game is a mouse! Clicking on any of your pieces will bring up all of that piece's information and stats, as well as highlight the spots that piece is able to move to. To move one of your pieces, select the one you wish to use, then click one of the available spots. To attack an enemy, click your piece and click the enemy you wish to attack. In order to attack an enemy, they will need to be within the range of your piece. Any successfully defeated pieces, both yours and your enemy's, are removed completely from the board. The aim of this game is a simple one: defeat the enemy Eyrie while making sure to protect your own. This game is about strategy, how best to use your pieces against your opponent's and how to best protect your leader. We'll get into tips for strategizing a little later on. You can choose three modes to play in: easy, medium and hard. In easy mode, in addition to being able to see all the information about your pieces, you can also click an enemy piece and see their stats as well. In medium mode, there is no differentiation between enemy pieces. They all look the same. You also will not know any stats on the pieces until you interact with them (you attack them or they attack you). In the hardest mode, all the enemy pieces are the same again, and you never see any stats of the enemy pieces. It's up to you to deduce their values based on how they interact with yours. These stats are important because they dictate how your pieces will behave and interact with the others on the board. Each piece has three values, an Attack value, a Defence value, and a speed value. Attack: When you attack an enemy piece, your Attack value needs to be higher than the Defence value of the piece you're attacking. This allows you to "beat" your opponent, removing their piece from the board. If your Attack value is lower than their Defence value, their piece will remain on the board while yours will be removed. The exception to this is your Xweetok. Though her attack value is lower than the defense of the enemy Scorchios, her ice state allows her to defeat the fiery Scorchios. Defence: This value is important when your opponent attacks you. Similar to the above, if the Attack value of the piece attacking you is higher than or equal to the Defence value of your piece being attacked, you will "lose" and your piece will be removed from the board. If your Defence value is greater than or equal to the Attack value of the piece attacking it, the opponent's piece will be removed. Speed: This value dictates how many spaces the selected piece can move in one turn. Each piece can move left to right and up and down. You're not able to move diagonally, but you can move some pieces to diagonal squares because the location would be a result of mixing horizontal and vertical movement. NOTE: Your board will not always be the same. This is one of the many options you will have when you start the game. The most important piece on the board. Once one of them is defeated, the game ends. You must destroy the enemy's Eyrie while protecting your own. Good offensive, but you're going to want to try to keep him from being targeted by the enemy, as he has weak defensive skills. Wholly mediocre soldiers, the Kougras can be good to use in medium and hard modes to canvas the field and test the stats of the enemy pieces, while occasionally getting in some lucky winning strikes. What these pieces lack in attack strength, they make up for in defensive prowess. They can be used to help fortify your Eyrie, if you can coax your enemy into attacking them. A slower, yet well-rounded powerhouse, the Skeith is another piece that is good for canvassing the board in medium and hard modes, and useful for planning out offensive strikes in easy mode. The fastest piece on the board, Xweetoks are also the only pieces able to jump obstacles on the field. Though their stats are rather weak, they can be boosted by collecting potions on the board. In medium and hard modes, you do not get to see which enemy pieces are which. They will all appear to you as the image above. There are three different potions that can appear on the field. Each potion will add an extra point to a stat of the piece that collects it for one turn (the strength and defence boosts are effective on the next turn the piece performs an attack or defence action). Though the mechanics of the game are fairly simple, it requires a lot of strategy if you wish to be good at it. The following tips come to us from TDN fan Sarn. 1. Your first goal should be to get the blue potion with one of your Xweetoks. 3. Once your Xweetok has consumed the blue potion, head towards and defeat the enemy Gelert. If your Xweetok dies before reaching the Gelert, it is best to restart. If the enemy Skeith is near the Gelert (and even if the enemy Eyrie is near the Gelert), it is best to restart, as, even if your Xweetok is able to attack the Gelert, she will not survive an attack by an Eyrie or Skeith. The blue potion only lasts through being attacked once, so if the first attack on your Xweetok is by anything other than an enemy Kougra, restart. 4. Quicker is better. The less turns it takes you to win a round, the more points you get. For each turn under thirty, you get fifty bonus points. So if you complete a round in 28 moves, you get 100 bonus points. 5. If you're aiming for a trophy score, you can maximize your efficiency by restarting the game if it takes you more than 12 turns to win a round. Additionally, if your score is less than 2450 after the first round and 5100 after the second round, you would do best to restart the game if aiming for a trophy. Though Sorcerer's Skirmish may appear daunting at first, the gameplay is really quite simple. All you need to do is refine your strategy and you can be master of the battlefield in no time!